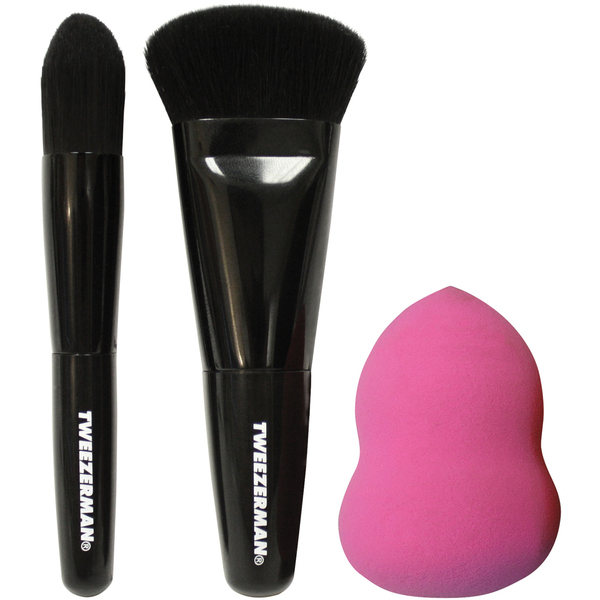 Tweezerman's Brush iQ Mini Contour Brush Kit combines the perfect tools for achieving a flawless makeup base. Certified by makeup artists, the travel-sized brushes and blending sponge allow you to expertly and easily apply your foundation with professional results. The brushes utilise Dunpont Natrafil patented technology which optimises the pick-up and release of product. Perfect for applying cream formulas such as primers and liquid foundations. Its synthetic hairs are more hygienic than animal fibres, and perform with unrivalled results, picking up and delivering products for flawless skin. The travel-sized brush is perfect for covering large surface areas but also for detailing in natural curves and contours; its tapered tip enables perfect coverage in hard-to-reach areas. Perfect for contouring and defining facial features. Its synthetic hairs are more hygienic than animal fibres, and perform with unrivalled results, picking up and delivering products for flawless skin. The travel-sized brush features a unique angle to blend seamlessly along the angles of the face. Perfect for blending foundation along the hairline and jawline, this hypoallergenic (non-latex) sponge can be used damp or dry and creates a natural finish on skin. Velvety soft and a must-have for seamless blending.